HartyHarHar: Shake your Soul Friday night! THIS FRIDAY, LOCAL band Soul Shaker plays at Blues In The District in Washington Park. Second String Music is one of the main sponsors and we are proud to support local musicians. 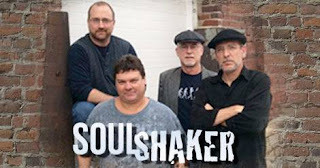 Soul Shaker is an excellent band. It features guitarist and singer Eric McCaughey, bass player Jeff Van Kanegen, drummer Steve Hufford and multi-instrumentalist Burt Shackleton. Eric, Jeff and Burt all played in the Cheeseburgers and they are all great players. I know they play a lot of blues, and they are also into R&B and soul. But in the end, who really cares? If you go Friday and they break into a Motown or classic rock song, you can get your money back at the door. Wait. There's no cover charge, and you can bring your own beverages into the park? Music is music and easy to enjoy. I guarantee these guys will play their butts off and will entertain the crowd. They will be just as good as any national touring act. When I go see a band and I see them working hard and having fun, well, it doesn't really matter what they are playing. I commend The District for having at least one local band play every summer for Blues In The District. We will be partying on the sidewalk and coming into the park for the show. As always, support your local musicians and artists. The talent around here never ceases to amaze us, and we are excited about sponsoring Friday night's event!